For decades after the Second World War, the German people were regularly castigated for having done little to stop the murderous actions of Hitler and his cronies, particularly after 1941 when it became common knowledge that the Nazis were systematically wiping out millions of Jews, Poles, Gypsies, homosexuals and the mentally and physically impaired. It must be remembered that the German people at the time were generally nonpolitical, having initially seen the Third Reich as the savior of Germany's economy, ideals, philosophical thought and racial purity, but later avoided speaking out against their government out of denial or fear of reprisal. By 1943, Germany was essentially a concentration camp to its own people. Any active domestic resistance against the Reich---including listening to anti-Hitler radio broadcasts or neglecting to raise one's arm in the Heil Hitler salute---was punishable by imprisonment, deportment to a concentration camp, or death by firing squad, hanging, beheading or forced suicide. Consequently, most Germans elected to do nothing. 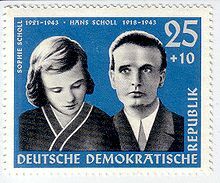 Hans and Sophie had both been supporters of the Nazi regime in the late 1930s, when they were enthusiastic members of groups like the Hitlerjugend and Bund Deutscher Mädel, which were created by the Reich to raise a generation of single-minded Hitler followers, obedient baby-makers, and cannon fodder for future wars. But by 1941, on the basis of rumors and stories they had heard, Hans and Sophie realized that disaster was coming to Germany. While attending the Ludwig Maximilian University of Munich as a medical student in early 1942, Hans and a few close friends decided that doing nothing against the evil of which they were now fully aware was unconscionable. In the spring of 1942 they organized a secret, loosely-knit alliance they called (for no particular reason) die Weiße Rose (the White Rose), whose purpose was to spread the truth in the form of anonymous letters and leaflets denouncing Hitler and the Nazi regime. In doing so they realized that their plans were seditious, and that if caught they would all most likely be executed. Sophie joined Hans in Munich on May 9, 1942 (her 21st, and final, birthday) to attend the university as a biology and philosophy student, and it was there that she was brought into the White Rose movement. 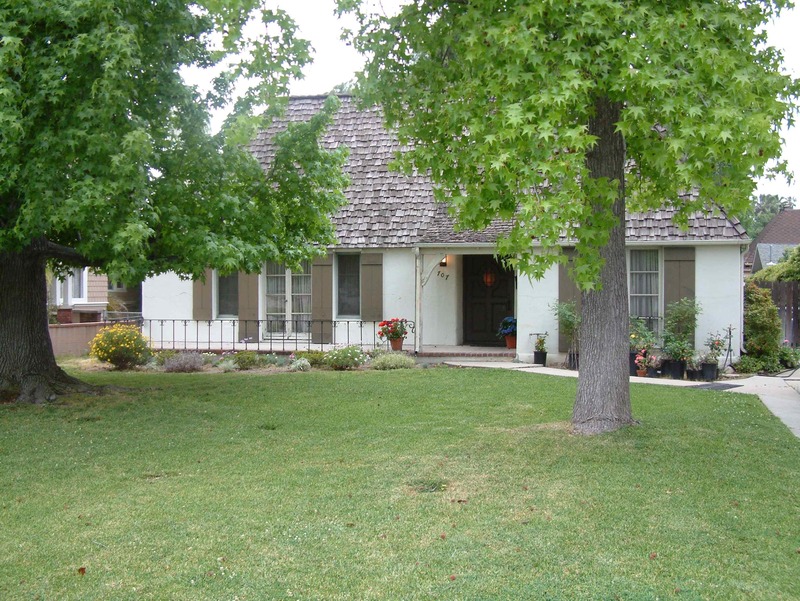 Within months the group had discretely distributed thousands of leaflets and letters that they had prepared using an old typewriter and mimeograph machine. In July, Hans' medical education was interrupted by a stint as a conscripted student soldier at the Russian front, where he witnessed first hand the murder and forced labor of enslaved Russians, Jews and Poles by the Germans. He also participated in the disastrous military campaign in Stalingrad, where the German army lost an estimated 330,000 men killed in battle. He returned to Munich in October and resumed his clandestine activities with his sister and friends. Hans, Sophie and Christoph Probst at Munich Rail Station, July 1942. Hans is on his way to the Russian front. On February 18, 1943 (the same day that Reichsminister Joseph Goebbels delivered his infamous "Total War" speech in Berlin), Hans and Sophie went to the university to distribute hundreds of copies of their sixth, and final, leaflet. Back out on the street, they discovered they still had a number of leaflets in one of Sophie's handbags. They returned to the main hall of the university, just prior to the dismissal of the day's classes, where Sophie hurriedly tossed the remaining leaflets into the atrium. Unfortunately, the school's janitor spotted them in the act and made a citizen's arrest before they could escape. Hans and Sophie were turned over to the Gestapo who, over the next three days, forced confessions out of them. On February 22 they stood before the fanatical Roland Freisler, Hitler's "hanging judge" from the notorious Volksgerichtshof (People's Court), who had been flown in from Berlin especially for the trial. Showing uncommon courage, Hans, Sophie and Christoph Probst, a fellow White Rose member, were condemned to death for treason against the Reich. They were immediately returned to Stadelheim Prison where the guards, moved by Hans' and Sophie's calm bravery in the face of impending death, allowed them to meet with their parents one last time. "Remember Jesus, Sophie" were her mother's final words to her doomed daughter, with Sophie replying Ja, aber du auch ("Yes, but you as well"). At the time of their deaths Hans was 24 years old, and Sophie was only 21. Today, in honor of their courage and sacrifice in the name of humanity, Hans and Sophie Scholl are considered the fourth greatest Germans to have ever lived. Einstein comes in a distant 10th. My soul is like an arid wasteland when I try to pray to you, conscious of nothing but its own barrenness. My God, transform that ground into good soil so that your seed doesn't fall on it in vain. Do not turn away from me if I fail to hear you knock; open my deaf, deaf heart. Make me restless so that I may find my way to the repose that dwells within you. I am so powerless. Receive me and do with me as you will, I beseech you, I beseech you. Do with me the best you can, for you wish us to call upon you and have also made us responsible in prayer for our fellow creatures. I likewise think of all others. Amen. --- From Sophie's diary, 15 July 1942. Inge Scholl, The White Rose: Munich 1942-1943, Wesleyan University Press, 1983. Hermann Vinke, The Short Life of Sophie Scholl, Harper & Row, 1984. Inge Jens (Ed. ), At the Heart of the White Rose, Harper & Row, 1984. Die Weiße Rose, 1982. German actor Lena Stolze's portrayal of Sophie Scholl is brilliant, and her resemblance to Scholl is uncanny. Both she and Julia Jentsch (see below) both won the Gold Film Award at the German Film Awards as "Best Actress" for their portrayals. Fünf Letzte Tage, 1982. Another film starring Stolze, relating the brief friendship between Sophie Scholl and fellow female cellmate Else Gebel at Stadelheim. Sophie Scholl: Die Letzten Tage, Zeitgeist Films, 2005. Nominated for Best Foreign Language Film at the 2005 Oscars, this tense, soul-shattering but ultimately life-confirming film has a companion disc that includes many interviews with Scholl friends, family and co-conspirators and related historical footage. Overall, a wonderful film that is both an indictment of fascism and a testament to the human spirit. Untergang (Downfall). Sony Pictures, 2005. Also nominated for the year's Best Foreign Language Film, this is a riveting and historically accurate reenactment of Hitler's last days in the Führerbunker, based on Soviet interrogation files and personal recollections of Traudl Junge, Hitler's personal secretary. 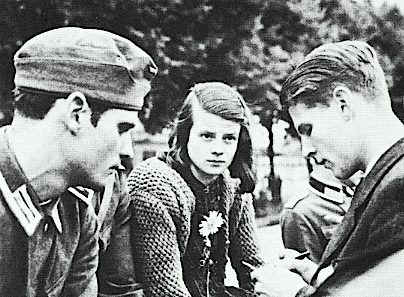 The film includes an interview with Junge recorded prior to her death in 2002, in which she compares her naivete as a Hitler admirer with the bravery and sacrifice of Sophie Scholl, who was the same age as Junge.